RHS Trained covering gardens in Norfolk & Suffolk. My name is Marian Foster marian@the-ladygardener.co.uk I am the Co- owner of The Garden Room but i am also a R.H.S trained Lady Gardener/Horticulturist. I have a City & Guilds in Garden Design and many years experience in the trade and work with many customers throughout North Suffolk & South Norfolk. As a Lady Gardener i specialise in Flower border beds,weeding,planting etc. Most other Gardeners just want to cut your lawn [they won't touch beds]. I do also cut lawns,prune tree's,roses,hedges etc. 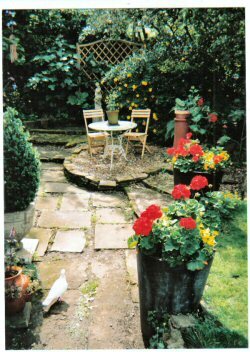 My Garden consultations [where i vist your Garden to discuss your plants or Design are extremely popular. I have a City & Guilds in Garden design and can draw you up full scale plans of your Garden. I also draw up full Planting plans with botanical names for your Garden. Although my Head office is in Needham Market,Suffolk i am actually based in the Waveney Valley on the Norfolk,Suffolk border.